Hey Guys and Girls, it’s been a while, but I’m back with a character interview from my current project – Unwish. Today, we’re talking with Argus Pius-Ovid. Bisi: Good afternoon Argus, thanks for agreeing to talk to me today. Argus: Sure, but you should call me Sir Argus. Bisi: Sir Argus, of course. Please Sir Argus. How old are you? Where are you from? Argus: Seventeen. I’m a highborn from Duka, Barina Province. I’m a warrior, like my father before me. Bisi: You’re a highborn? What does that mean? Argus: Basically, it means I’m a noble and of high birth. I’m better than most people—including you. Bisi: Oh, okay—em, can you tell us, what’s your idea of perfect happiness? Argus: For me, it’s day by the lake with friends, dark wine and a pocket full of gold sheks. Simple things make me happy. Bisi: What is your greatest fear? Argus: Nothing, fear’s for fools. 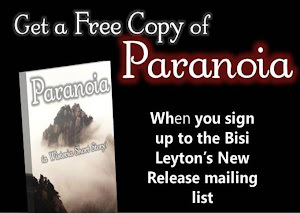 Bisi: Seriously, there must be something that scares you or keeps you up at night. Argus: No, because I’m not a coward. Bisi: What is the trait you most deplore in yourself? Argus: Hmm, that’s kind of a stupid question woman. Bisi: Okay, but could you try and answer? Argus: [laughs] That’s easy, there’s nothing wrong with me. I love every part of myself. Bisi: What is the trait you most dislike in others? Argus: I hate girls who don’t know their place, especially plebians. Daya, there was this one trull who acted like she was something—special. She was eventually beaten in line, but she’s still not fully learnt. Bisi: Are you talking about Ivy? Argus: Yeah, that was her name. Bisi: You don’t like her much. Argus: [shrugs] I nothing her because she’s completely irrelevant to me. Bisi: Is there someone you actually admire? Argus: It’s gotta be Amadeus Cadmus-Jonas, he’s just a decent guy—although tries too hard to be honourable, but I like the fact he hardly lies. Bisi: On what occasion do you lie? Argus: [smiles] Lies make the world go around. Bisi: I take it you lie a lot. Argus: Why do you care about that? Listen, I’m getting bored. Bisi: How about this? What is the quality you most like in a woman? Argus: I said it before. I like a girl who does what she’s told, which is what every guy wants. Not that you’d understand. You’re not a man, but trust me it is. Bisi: Which words or phrases do you most overuse? Argus: Honor—where I’m from people are obsessed with appearing to be honourable. The thing is no one’s totally clear on what that actually means. Bisi: What is your greatest regret? Argus: [pauses] My father, he wasted his inheritance. Argus: I’m a highborn, I’ll never be poor. We get an allowance from King Rasmus, but I’ll never have Cadmus-Jonas money. Bisi: Amadeus is a Cadmus-Jonas. Does his family’s money affect your friendship? I mean, this grandfather is the wealthiest man in your country. Argus: Nah, Amadeus barely realises he’s rich. He acts like—if you’re asking if I’m jealous or something, I’m not. My family is royalty and no amount of money will make the Cadmus-Jonas more than wealthy butchers. I’d rather die than lose my royal blood. Bisi: How would you like to die? Argus: [shakes his head] I’ll never die.